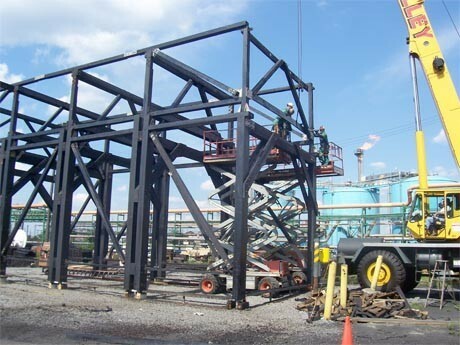 This project required selective demolition, foundation repairs, and construction on a new 92-foot wood and timber water quenching tower for ArcelorMittal. The quenchtower is a structure built over railroad tracks housing a mechanical piping and spray bar system that allows rail cars of hot coke to roll underneath it and receive a quenching spray to the hot coke. 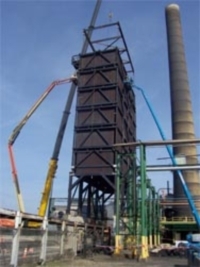 The challenge was removing and replacing existing tower within 15 days-the length of the scheduled plant outage. Planning with various team members helped Precision overcome the scheduling challenge. Prior to the shutdown, we engineered, and then constructed the tower into six stackable sections. This required the fabrication of steel framed jigs to precisely control the dimensions of each section. These prefabricated sections were then delivered and staged at the site. At the time of the outage, the existing structure was removed and the prefabbed sections installed. The pre-constructed stackable modules went together exactly as designed. Since the operation was ahead of schedule, the plant was able to employ us to make additional upgrades to their plant including concrete repairs to the quench pit and sluiceway, concrete repairs to the sulfur pit, and masonry repairs and roofing replacement at their pump house. Selective demolition, foundation repairs, and construction on a new 92-foot water quenching tower in a steel plant.